I understand why people use convenience foods, I really do. More than once I’ve grabbed a ready-to-heat curry or a pack of chicken Kievs in the supermarket on a cold Friday night at the end of a long week, when I feel as if I will lose the will to live if I have to go home and stand on my glacial kitchen floor and cook. And as I’ve said before, I freely admit to buying Thai curry paste and pesto rather than making my own. But the one thing I cannot comprehend is why people buy packets of soup. Yes, they are convenient, but they are also packed with salt, in order to disguise the fact that there is not much flavour to speak of, and they have close to no texture (watery does not count as a texture!). And although they look like a huge time-saver, they aren’t really because … making your own soup from scratch does not take that long. And (say after me, kids!) it’s easy! I learnt the basic formula for making any vegetable soup from my late friend Peter, whose recipe for warm avocado soup has outlived him. You need about 2 cups of vegetable of your choice (which you then either steam or roast and mash), 2 cups of stock and 1-2 cups of milk depending on how creamy you like your soup. Plus of course some seasonings – but those are the basics and you don’t need to fiddle with them much to get a good soup. You also need a wand mixer, unless you a) like your soup really chunky, or b) have very strong arms to power your potato masher! Not so intimidating after all, is it? Seeing as we are off to South Africa for a holiday soon (woo hoo!) I am on my usual mission to use up stuff in the fridge. On Sunday night, it was the turn of two large potatoes and 2 rather antiquated leeks: doesn’t that just scream leek & potato soup to you? It did to me, and I have to say it was one of the better ones I’ve ever made. Because the potato, once mashed, adds a naturally creamy texture you can be quite virtuous with this and add little or no dairy. Or you can splurge and add double cream – it’s up to you. I garnished mine with some crispy fried leeks which were a hit both with me and Nick, and (there’s that word again) EASY! Heat about 2 Tbsp olive oil in a large saucepan. Add the garlic and the sliced leeks, reserving about 4 Tbsp of leek slices for the garnish. Add the potato cubes and sautee until the leeks begin to colour. Add 2-3 cups of chicken stock (depending on how thick you like your soup) and bring to a simmer. Simmer on low heat for about 20 minutes until the potato cubes are soft enough to mash. Remove from the heat, mash with a potato masher to break up the largest chunks, then add the milk or cream and blend with a wand blender until smooth enough for your liking. Add the dried thyme, check for seasoning and add salt and pepper to taste. If the soup is too thick, add a little moe water. Return to low heat. In the meantime, heat a Tbsp of olive oil over medium hight heat in a small pan. Add the reserved thinly sliced leeks and stir to break up the leek slices into strips. Watch carefully as the leeks burn easily. When they start to turn golden brown, remove from the heat and allow to cool on a piece of paper towel – they will crisp up as they cool. 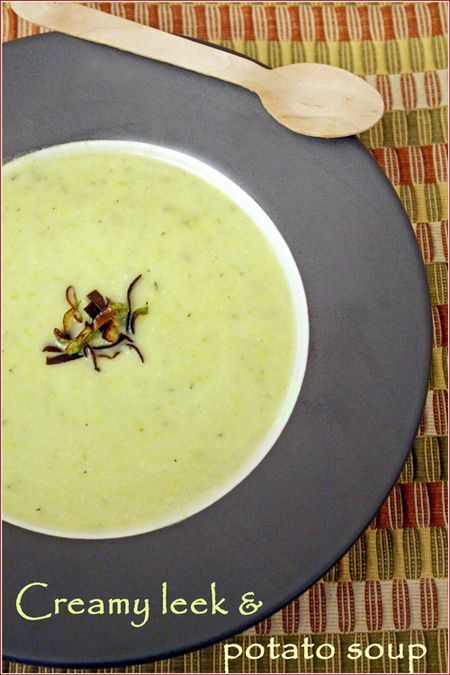 Serve the soup with a garnish of crispy fried leeks and some crusty brown bread. Please remember to vote for me in the 2009 SA Blog Awards where I am a finalist in the Best Food and best Overseas Blog categories! If you click on the “vote this blog” logo below you will see that CookSister has been pre-selected for you in these 2 categories. Just scroll to the bottom of the form, enter a valid e-mail address (compulsory) and send your vote! Only one vote is allowed per valid e-mail address, and once you have voted a link will be e-mailed back to your address. You must open the e-mail and click on this link in order to complete your vote, otherwise it will not be counted (see the rules for more info). Voting is open from now until 31 March, with the winners being announced on 3 April at the usual glittering awards ceremony in Cape Town. Any chance you’ll be visiting Cape Town???? The soup looks so “easy” and yummee, I can’t wait for winter!!! Good luck with the Blog Awards. I’ll have to confess that I actually quite enjoy the canned cream of asparagus soup. Ha ha ha! But I will give it up any day if you would serve me a nice hot bowl of your beautiful creations! i am so with you… although i’d argue that ANY convenience food is full of salt! i will be using up a ton of veg that’s been in the fridge since my last big shop, jerusalem artichokes, shitake, carrots, broccoli… although i think I’ll go down the chunky road with so many different flavours who all want to experience them individually. some grated cheese on top or a drizzle of lemon, crusty sourdough – weekday dinner, here i come!!! This looks fantastic Jeanne. I agree soup is super easy! Also great to make up a big batch and freeze it in portions for those Friday night dilemmas. 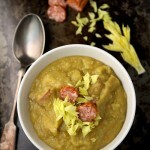 I so wish that my children all liked soup – only one does, so that is one easy meal relegated to only occasional use. Enjoy your trip over here and let me know if you have any free time to visit. If all our votes triumph we’ll come and cheer you on at the glittering blog award ceremony! Such a classic, humble soup. Looks really delicious too Jeanne. Potato/leek is such an awesome combination. 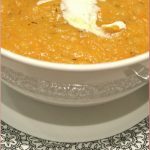 This soup looks so simple and delicious. I love the color, too. I have never made this soup before. I look forward to trying it out. Leak and potato soup is so simple and yet so good! Great shade of green! 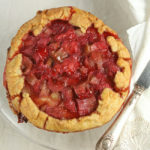 Thanks for a great write-up before the recipe, it seems so much more personal! 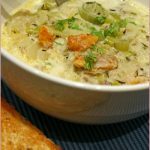 Your recipe for potato and leek soup was the best of the selection, but it was your name that prompted me to check it out! Your having been to SA I see, you might have come across a “Koeksister” that is a traditional Afrikaner and Malay sweet snack. It’s a twisted deep fried dough, dipped into a sweet syrup deliciosity! So that’s why I wisely chose the best soup recipe?